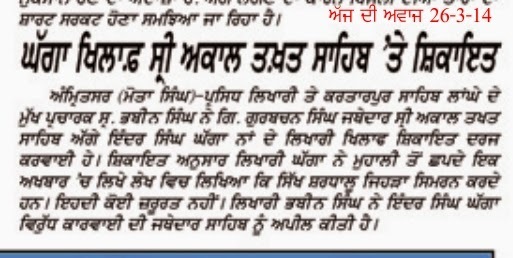 On our exposing the real face of Inder Singh Ghaga who desecrated the Sikh concept of Japp/ Namsimran by publishing an article on 19-3-14 in the in-famous tout newspaper called Spokesman, Ghagga gets infuriated and we are receiving threatening calls again and again. Here we have recorded one of the calls where the caller with caller identity concealed that Ghagga men will continue to harass us. I am sorry I too used abusive language because I was not prepared to hear his abuses. He continued to call us till 10 pm until we switched of our sets. In the morning at 3 AM when we opened our sets the man was astonishingly there to abuse us. Here is a recording in Punjabi. Since Facebook allows only videos we have therefore attached some photos with the sound file.